LOS ANGELES (AP) — Patrick Mahomes threw for the most yards in the NFL this season and had his second six-touchdown game. But it is the five turnovers the Kansas City quarterback committed that led to the Chiefs dropping their second game this season. Chiefs coach Andy Reid said the Marcus Peters interception with 1:18 remaining was mostly the result of pressure by Ebukam. The last one, which was picked off by LaMarcus Joyner with 13 seconds remaining at the Rams 28, was Mahomes trying to make a play late. The two fumbles were the results of strip sacks by Aaron Donald, who has a league-leading 14.5 sacks. 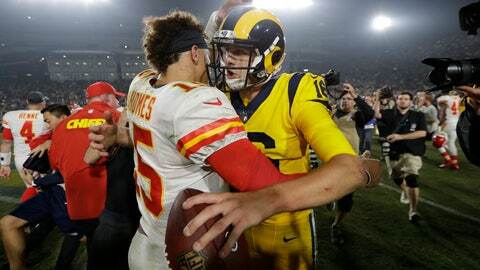 Rams linebacker Dante Fowler Jr., who has faced Mahomes twice this season, said he felt like Mahomes was getting a little rattled late in the game. “When you are in situations like that, his first year in situations like that, it’s kind of hard. We put the pressure on him and we did a good job,” Fowler Jr. said.